This set of resources from the Robert Wood Johnson Foundation can benefit those helping to guide their cities and towns towards becoming more Age- and Dementia Friendly. The site provides helpful knowledge of what it means to have health equity present in a community, and how stakeholders can take steps to achieve it. There is also an opportunity to share your stories and experiences confronting health equity issues. 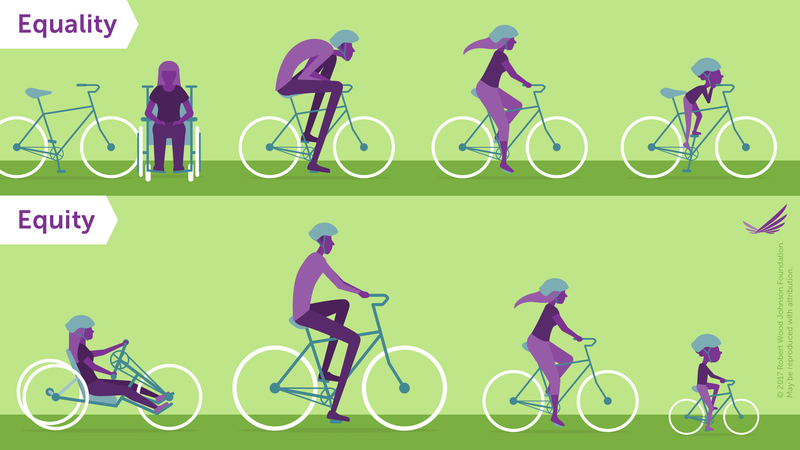 Finally, to help promote and visualize “building a culture of health,” RWJ Foundation has provided a graphic displaying that, when it comes to expanding opportunities for health, thinking the same approach will work universally is like expecting everyone to be able to ride the same bike. This is similar to the Age-Friendly movement where each community or region can prioritize what matters most to their residents in terms of aging well. Download and share this image to #PromoteHealthEquity, and help create a shared vision of better health for all.